Jonathan, who are you?I am Jonathan Fesmire of Santa Cruz, First of His Name, the Geek, the Steampunk, the Intellectual, Writer of Fiction, Father of Gingers. I still think of Santa Cruz, California as home. I grew up in Santa Cruz County and got my BA at U.C. Santa Cruz. In fact, Bodacious Creed takes place in an alternate version of Santa Cruz in 1876. More specifically, I grew up in Watsonville, California, part of Santa Cruz County, though my heart has always been in Santa Cruz itself. I’ve lived all over the county, including in Aptos, Soquel, Capitola, and Santa Cruz. I have two. My daughter’s birth, and my son’s birth. There’s no more amazing feeling than seeing your own children come into the world. So true. What’s the dumbest purchase you’ve ever made? I bought a 3D printer a couple of years ago, thinking I would somehow make money with my 3D model designs, but the printer had too many problems. I live in Anaheim, California, so my son and I are close to the Disneyland Resort. When we have annual passports, we’re able to go often. It’s pretty amazing being able to go to Disneyland just for the evening, go on a few rides, get a bite to eat, then come home. I'll bet! Have you been in any natural disasters? I was in the heart of the 1989 Loma Prieta Earthquake, on Cathcart Street, oddly enough, in the main area where Bodacious Creed takes place in its alternate reality. The roof collapsed at the Ford’s store across the street from where I was. The popular Cooper House, made primarily of stone, fell to pieces. Many other buildings suffered significant damage. That was an amazing night in the sense that everyone came together to help each other, just incredible cooperation. But Santa Cruz is like that. The busses ran for free to get people home, and since I took the bus to work at the time, that’s how I got back to Watsonville. As it turned out, the area where I lived had also been hit hard. Many of the houses had slid off their foundations. Our fireplace had fallen into the driveway and the indentation in the pavement remained for years. My family, and a friend of mine who was able to make it to my place but not his, slept in the back yard that night. Wow. What’s one thing that you wish you knew as a teenager that you know now? I wish I had known that writing was the thing I wanted to pursue, and I wish I knew that, once the Internet came, I could start building my reader base. Standing in line or waiting at an office with nothing to read. I’m lucky that for my day job, I’m a copywriter. I get to write for a living. That’s amazing. Yes it is. Would you rather be a lonely genius, or a sociable idiot? A lonely genius. Stupidity is ruining the world. How true is that! If you could live anywhere in the world, where in the world would it be? I would love to live in Paris. I speak French but rarely get to use it and loved Paris when I visited. There’s great cuisine, amazing little cafes, many fascinating museums, and you can get anywhere quickly on the metro. Besides, there’s a Disney park nearby. This book started as my thesis project for graduate school. It wasn’t even a story exactly at first, but a background and set of characters for my 3D modeling demo reel. Since I was already a writer, I also thought it would make a great novel. I had ideas for a gunfighter type character and a young brothel madam who was secretly an inventor, but didn’t have names yet. One morning as I was waking up, the name Bodacious Creed popped into my head. I figured I must have heard it before. It had to already be the name of a character somewhere. So, I looked it up. To my surprise, it wasn’t being used. I decided that I’d better take it before someone else did! Is Bodacious Creed part of a series? This is the first book in an intended series. I’m doing research and brainstorming for the sequel now. At this point, there’s not much readers need to know aside from what’s in the first novel. As a primer, however, I’ll share a bit. 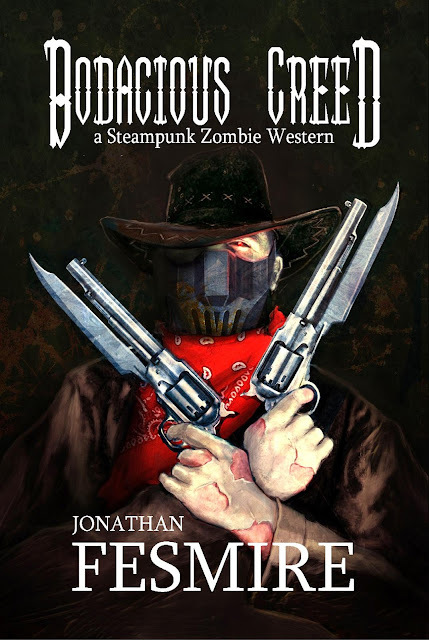 Bodacious Creed takes place in an alternate history, a world where, in the 1870s, steam-based technology begins advancing rapidly. In other words, a steampunk world, though of course the specifics are of my own invention. It’s a western, it’s hard science fiction, and it has zombies. Awesome! How did you create the plot for this book? For me, plot comes primarily from the characters. While I knew some things that I wanted to have happen, it had to make sense for the characters to get to those points. Basically, after every chapter or even scene, I mentally check-in with my characters on their goals and motivations, which can change based on things they have just experienced. Then, I figure out what the characters—those specific characters—would do next. In Bodacious Creed, one character is fully based on a real person. It’s the bounty hunter Rob Cantrell. When I decided to write this novel, I ran a Kickstarter to find it. This was an amazing experiment. Not only did it reach its funding goal, but I was able to get input from readers for the story. Rob wanted a version of himself to be in the book. Once the Kickstarter ended, I sent him a release of likeness contract so I could do this legally, and his doppelganger is a major part of the story. In years past, I’ve had agents, and they had difficulty placing my books, even though they enjoyed them. Once self-publishing through print on demand became possible, I embraced it, especially when Lulu opened its services, as those were free to writers. I now use Create Space. The thing is, I learned early on that all the worries I had about self-publishing apply to traditional publishing, too. Writers in both camps must do their own publicity. Self-published authors can ensure that their books are as well-written and edited as any traditionally published book. Also, many writers who have made it big had their books rejected dozens of times from big publishing houses. J.K. Rowling had a tough time finding a publisher for the first Harry Potter book. It’s tough to read Harry Potter and the Sorcerer’s Stone and not recognize that it’s exactly the sort of novel that young adults want to read. You are so right. So you're happy with your decision to self-publish? I am. What I needed to learn was how to better promote my books, and it took a while to find good sources for that information. In short, the most important thing to do is build a following using one’s own mailing list, social media, and making connects with others, such as fellow writers and reviewers. As I worked on Bodacious Creed, I kept up my blog and built my following, or platform. Because of that, it’s been doing well. Now, I want to keep that momentum going as I write the sequel. 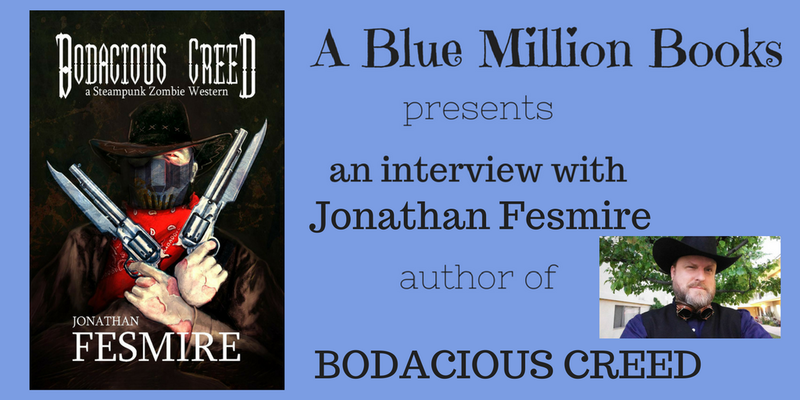 For Bodacious Creed, I set up pre-orders on Amazon for both the Kindle edition and the trade paperback, and that brought in a lot of sales in the month or so before the book’s release. Then, I ran a Facebook release party the weekend after the book came out, before the Kindle edition went up from its pre-order price of $1.49 to its regular price of $3.99. I have an art degree, so I was able to create the full cover using the cover art by Joshua J. Stewart. Though I’ve formatted book interiors in the past, this time I used the CreateSpace template for 6x9 trade paperbacks, and that worked well. I’m pleased with the result. I also had several beta readers who commented on the book as I rewrote it, and who found various small errors. Since the book is self-published, if someone finds a small error and points it out to me, I can correct it and fix it immediately for the Kindle edition, and also update the trade paperback, so that new orders will have the fix as well. Alas, if I had the money to hire a professional editor and pay him or her fairly, I would, and may in the future. Still, the copy is a clean as what I find in most traditionally published books. I am working on the sequel to Bodacious Creed. While the first novel takes place in an alternate Santa Cruz, California, the second will mostly take place in San Francisco. To that end, I’ve been researching San Fran, learning about its history and many of the colorful characters who lived there. The first book has two people in it out of Santa Cruz history. I want to have more in San Francisco. Anna Lynn Boyd served drinks with one of her doves, Karla Hotchkiss, and kept an eye on the saloon. She grabbed a cloth from under the bar and wiped down the walnut surface that captured the blurry reflections of her patrons. Cowboys, hostlers, ranchers, and factory workers gulped ale and whiskey and downed their meals. Today's specials included shark, tuna, seasoned beef steaks, rye bread, fresh corn, and red potatoes. With the supper rush well underway, The House of Amber Doves, Anna's bordello and restaurant, had come alive with its usual evening activity. The exquisitely carved clock on the wall opposite the bar read six twenty in the evening. On this first day of July, eighteen seventy-six, the sun would still be out for another hour or so. A cool breeze turned the hot day pleasant as it blew through the double doors, carrying with it the salty tang of the ocean. Anna went to the far end of the bar, where her companion, Jonathan Johns, sat reading a book and working his way through an omelet stuffed with ground beef and onions and drinking a beer. Just twenty minutes prior, Jonny had downed a sugared coffee. Anna's twenty-year-old lover kept strange hours, which suited her fine. She did, too. It meant they could work together downstairs or make love in her bed as they pleased. She took a moment to look over the short blond hair and long features she loved. He resembled an angel out of an El Greco painting. What's more, Jonny had proven a better lover than any of the men she'd entertained in her years as a dove. More important to her though, he was smart, damned brilliant, actually. The book lay flat beside his plate, so Anna tipped it upward to read the spine. The day before, Jonny had gone through the newspaper in ten minutes. He had started this novel in the morning and had nearly finished it. Jonny pushed the book back down and turned the page. Jonny winked at her then continued reading. Anna ran her fingers through his hair, over his left ear, and felt the bumpy, curving metal form, less than an inch long. Her invention had saved his life, but Jonny could no longer speak. He could nod and shake his head, so they enjoyed simple communication. He helped with schematics in the basement. With his skills, he could have been working directly for Morgan's Automatons, but he preferred partnering with Anna. Yet speaking and writing remained beyond him. Anna went back to the center of the bar and took a moment to assess the room. Karla might need help with the customers, or a table might deserve a visit from the parlor's madam. Past the stairs stood Lucky and Dixie, two security automatons. Several more of Anna's girls leaned on the second-floor banister, gazing down at the patrons, waving, and blowing kisses. At the back of the stage, Hattie, a buxom blonde dove in a fancy blue dress, played the piano. Meanwhile, singer Nate Lieby, his wild ginger hair and beard giving him the look of a fiery god, and his musical group, Whiskey Zombie Collective, tuned up violin, bass, banjo, guitar, and mandolin. The group frequently performed at Amber Doves and some customers came in just to hear them play. Lorraine Silver strode into the saloon through the front doors to chat up a man at the bar. Her sharp voice cut through the chatter, piano, and shuffling cards. Anna had learned to tolerate that voice but sometimes thought Lorraine should talk through a pillow to tone it down. Lonzo Rivera smiled devilishly. “That right? That an invitation?” The deputy always had brothel coins for Lorraine. “Well yes, but not just that. Somebody just checked into the federal marshal office. At “federal marshal,” Anna, who had been pulling down a new whiskey bottle, froze. She watched them in the mirror past her own reflection. “You don't mean James Creed?” Lonzo asked. “James 'Bodacious' Creed,” Lorraine said, emphasizing the adjective. “Don't be jealous now, love.” Lorraine ran the back of her fingers down Lonzo's arm. Anna led the young woman past noisy tables to the stairs. The steelies, their polished hickory and steel bodies mostly still, watched as Anna walked past. Their rudimentary brains considered her safety their top priority. At the foot of the stairs, Anna stood with her left boot on the first step. “What is it, Miss Boyd?” Lorraine asked. “How do you know James Creed is in town?” Might this be Anna's chance to finally confront him? Highly self-educated, Anna felt no need for, nor faith in, prayer. Still, she held her palms together at her lips as though asking Jesus himself if this could be true. “You follow him in the papers?” Anna asked. “Always do!” With a peppy smile and a flip of her hair, Lorraine went back to the bar. Anna rushed out the front doors and turned left for Smullen's Stables and Livery, right across Soquel Avenue from The House of Amber Doves. Anna’s parlor was the tallest building along the street after the renovations late the year before, right after she had bought the business from the former madam, Margarita Fullerton. Few knew the truth of how Anna had acquired the capital to buy the establishment and renovate it outright. Most people believed she had come into a big inheritance, and that’s how she wanted it. She couldn’t risk a backlash against the two companies she invented for, Morgan's Mechanicals and Morgan's Automatons. If the world knew that a former prostitute had ushered in a new technological age, what might it mean for her family of doves? Anna strode down the row of horses, hay crunching under her boots, and reached her stallion, Espiritu, a black Saddlebred with white streaks along its back, almost like rib bones, and white patches on its face that gave the impression of a skull. Espiritu could look downright spooky at night. She had no time to saddle her steed, not if she hoped to make it to the federal marshal outpost while Creed might still be there, so Anna slipped on its bit and bridle, hefted herself up, her dress bunching between her legs, grabbed the reins, and guided Espiritu out of the stable, past the other neighing horses and the smells of manure and oats. “He’s here,” she whispered. The books he would read to her as a child. The secret code she’d invented and taught him. The hugs and laughter in front of their home's hearth back in Virginia, while her mother called them to dinner for chicken soup and homemade rolls. If only her mother could be there too, could return to life again just for a few days. Still, U.S. Marshal James Creed had come to Santa Cruz, California, against all probability. After years of hoping, Anna could finally see her father. 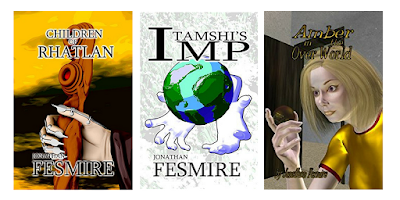 Author Jonathan Fesmire, originally from Santa Cruz, California, now lives in Southern California with his son. 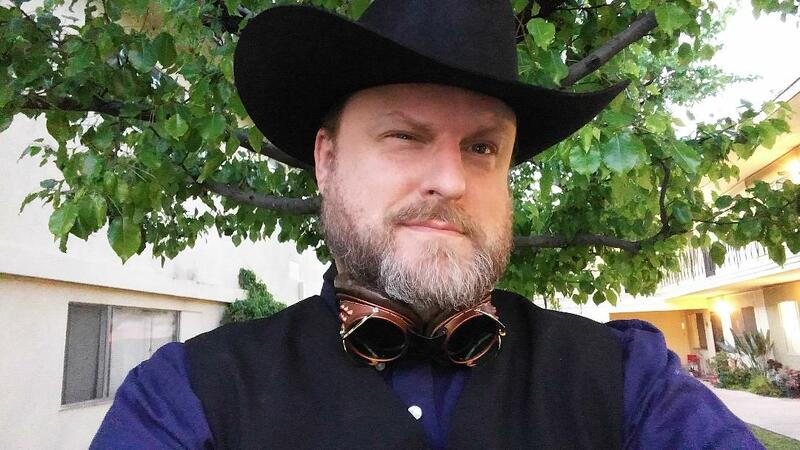 By day, he's a copywriter, by evening a steampunk author, and at all times, a dedicated dad. Though Jonathan started out writing fantasy, he has moved completely to steampunk, enchanted with its aesthetics, possibilities, and implications. He's a fan of the stories, the art, and the gadgets, and enjoys interacting with the community. In fact, Jonathan regularly interviews popular members of the steampunk community for his The Wild Steampunk Blog.